Ever been in the mood to bake but couldn’t decide between brownies or cookies? Well, thanks to Dorie, now you don’t have to. I had been eying this recipe for quite a while, but never had all the ingredients or the time to fuss. Fortunately, I did today and oh my god are these good! Then again, what’s not to like about a brownie with a chocolate chip cookie on top? I used semi-sweet chips instead of bittersweet. I baked mine for a total of around 35 minutes. I figured 50-55 seemed really long, so I initially checked them at 25 minutes then continued to add five minutes and check them again until they were done. Holy crap. That’s…probably the greatest thing ever. I love noshing with you, thanks for the great recipes. This recipe was on my short list. Good to know it’s a winner. Those brownies look delicious, yum yum. Best of 2 worlds. Have you ever made orange brownies? They have orange extract and orange zest in the batter and zest in the glaze, they have a glaze on top that is much like a glazed donut, they are very delicious. I am going to make them soon on my blog and will give the recipe when I do and let you know if you want to make them. these look amazing! gotta love the dorie recipes. B. has been begging me to make this recipe and seeing those pictures, I guess I have no choice now!! Holy wow! I made this for break the fast and they are DElish! After I made the brownie batter I was worried about how easy (or not) it would be to spread the cookie dough over without mixing the two together so I spread the brownie batter in the pan and tossed the thing in the freezer for about 10 minutes. Shockingly, it worked. But then I definitely needed the full 55 minutes for cooking. I’m not sure if it was because of the freezer trick but I pulled them out at about 50 minutes and some parts were less than cooked. Didn’t make them any less wonderful though. I’ll make them again but I might cut the brownie batter down a bit and make it more of a half brownie-half cookie rather than a brownie with a cookie top. Also, I used the bittersweet chips and it worked perfectly. Now I’m off to order Dorie’s cookbook. Thanks! Just stumbled across your blog and my mouth is simply watering (and I have pies to bake – so what am I doing sitting here???LOL! )…your recipes look heavenly and I think your photograps show your work quite well. 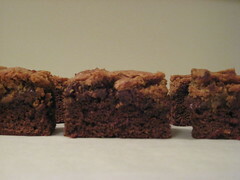 Happy baking – and be sure to check out our blog at http://joeybiscotti.blogspot.com. We all need to support each other in our endeavors to bring sweet things to the masses! I made these and they are a peice of heaven, thank you so much for posting this recuoe!